5 Ways Your Making your Home a Target! There are some common things most people do that make their home a target for break-ins. And they don’t even realise it! Stop doing the following right away! If you leave the garage open you are advertising to the world what you have up for grabs. Someone can just walk right in and take what they want or they can come back later and rob you. Leave your garage door closed unless you are parking your car or coming home. If you share holiday photos while still on holiday then you’re making an open statement to the world that you are not at home. It’s not ask risky as it sounds but if the wrong person sees the photos they know you are not going to be home for a long time. This makes your home prime for robbery. This tip comes from Phil. A fellow locksmith in Bournemouth. Phil does a lot of security audits and in our conversations he mentioned to me that he has seen an increasing number of break-ins with old broken alarm systems. Or alarm systems that are just not used. Use your alarm system if you have it! If it’s old or broken then get it replaced. Phil is my partner who I generally pass on all security audit work to. He’s been a locksmith in Bournemouth since 2010. If you want to get in touch head over to www.abacuslocksmiths.com – Abacus Locksmiths or you can message them on Facebook – Abacus Locksmiths. If you like your peace and quiet that is very understandable. But it pays to know your neighbors. If you don’t know them and they come home and see someone in your house thorough the windows they might just assume that it’s you. But if you know them they will know the work you do and possibly take a second look and realise it’s not you and call the police. Being friends with your neighbors pays off. They will have your back and you will have theirs! Simple, right? The reason for this post is quite simple. Our industry if fully of bad companies. The reason for this is that being a locksmith is quite lucrative. Think about it for a moment. If a locksmith get 5 call out jobs during the night and they are all night calls at £100 a pop that’s a good night. Almost zero operating costs and £15,000 a month revenue. This is why people are attracted to the industry who never go through any formal training and are not accredited. So how do you find a good locksmith? Is the locksmith you are about to hire accredited with an offical association? 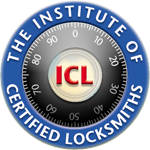 We are members of the Institute of Certified Locksmiths (ICL). There are others out there also like the MLA and the UKLA. Make sure the locksmith you hire is part of an association a this means their work has to be up to par. No fake locksmiths as they are called are part of associations. When the locksmith comes out to your property ask them for their ID card from the association. A god locksmith should hand this to you when their arrive as the first thing they do after saying hi. The best things you can do is to choose a specialist for what you need. If you are locked out of your car then you need to deal with a auto lock out specialists. If you are locked out of your home you need to deal with a locksmith who can deal with home lockouts as they differ form auto lockouts. You don’t just want to call a general locksmith as general lock fitting, repair and replacements is very different to lockout emergency situations. Ask for the pricing before committing to anything. The applies 10 fold when dealing with a night time lockout situation. The last thing you want to do is just have a locksmith come out and let you int your home and then charge you £200+ as you didn’t ask for the price before hand like this locksmith horror story. Agree on the price before hand over the phone. Andrew James is Bournemouth born and raised! For the last 12 years he has been running Andrew James Locksmiths. If you need emergency lockout assistance for you home, car or business he can help! He can also offer security advise. Call 01202 393547 Right NOW if you’re in an Emergency Situation. Copyright © 2019 Andrew James Locksmith. All Rights Reserved.